I colored her with Copics, the print paper and the stickers are by Reminisce. The "Make A Wish" sentiment is by Impression Obsession. 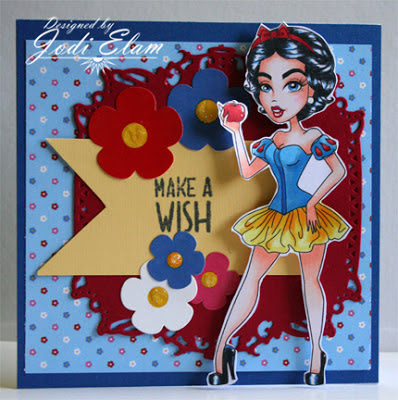 As always, make sure you leave a comment to be eligible to win Snow White, one lucky winner from the Sassy Studio Designs blog will win the entire collection! So hop along and check out all the fabulous sassiness! Five Simple Things - Inspire Me Fridays - Anything Goes! Love how you have kept to the traditional Snow White colours. Love the red die-cut. Lovely to see that everyone has her own take on the new images!!! Yours is really awesome Jodi.... lovely bright colours!!! Love your design and your colouring is fantastic it look likes she has been air brushed what is your secret to getting a image coloured so perfectly. Just awesome Jodi! AMAZING coloring and super cute design! Your coloring skills are fantastic. The hair and shoes are so shiny looking. Everything about the coloring truly is fantastic. Anybody that fussy cuts is my hero. Yours looks so nice and even. Jodi, 1 word...Wow! Okay a few more word. Everything is amazing. Your coloring is exceptional. And I love how you've pulled the primary colors together so perfectly. Gorgeous Jodi,I love the way you color and her hair is great. Stunning Jodi, you did such a beautiful job with Snow - now you need to teach me to colour hair like that. Jodi, Snow is absolutely Stunning with your gorgeous coloring!! Fab design with those flowers!! LOVE your coloring!!! Man I wish I had her shoes, LOL! Wow I am just seriously Beyond Words by the way you color.. Stunning. 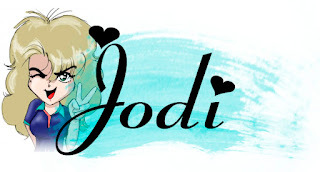 Jodi, I just love your style! Such SASS Jodi, she is YUMMY! Jodi she is FABULOUS!!!!!!!! !Love it! Jodi, first off your coloring is amazing! Love the added flowers too! Just adorable. Love the layout and your paper is just awesome. All those beautiful bright colors. Your coloring is awesome. Such a gorgeous card. I absolutely love Snow White. Just unbelievable coloring! And I really like the way you chose your papers to match your gorgeous Snow White colors. Wow, Jodi, this is gorgeous! I love how you've colored the image and matched the papers. Great job! wow Jodi this is amazing. The coloring is fabulous and the background is wonderful. Fabulous!! Great colours! Love it! Thanks for playing in our 'Red, White, and Blue' Challenge #68! I think she looks great in the 'traditional' Snow White colors, she looks so pretty! I love bold colors behind her too, she looks wonderful! AMAZING, Jodi! Love your exceptional coloring and fabulous layout! Jodi, your coloring is amazing as usual. Love the traditional colors, too. So pretty! This is perfect for our current challenge “Red, White and Blue” at Pattie’s Creations. Thanks for joining us!